1967 Wonder Woman TV "Pilot"
William Dozier was the producer of the 1966-1967 Batman television show, and he investigated the possibility of getting lightning to strike again but with Wonder Woman. What he came up with would not be considered "good" in any sense of the word, but viewing the Screen Test located over here is probably a worthwhile time investment of five minutes nonetheless. I never knew this footage existed until I came across it the other day. You'll recognize the voice of the narrator because it's the same gent who narrated the contemporaneous Batman show. The phrase "Same bat-time, same bat-channel" was made famous by this narrator, whose identity turns out to be... William Dozier! I never knew that before either! 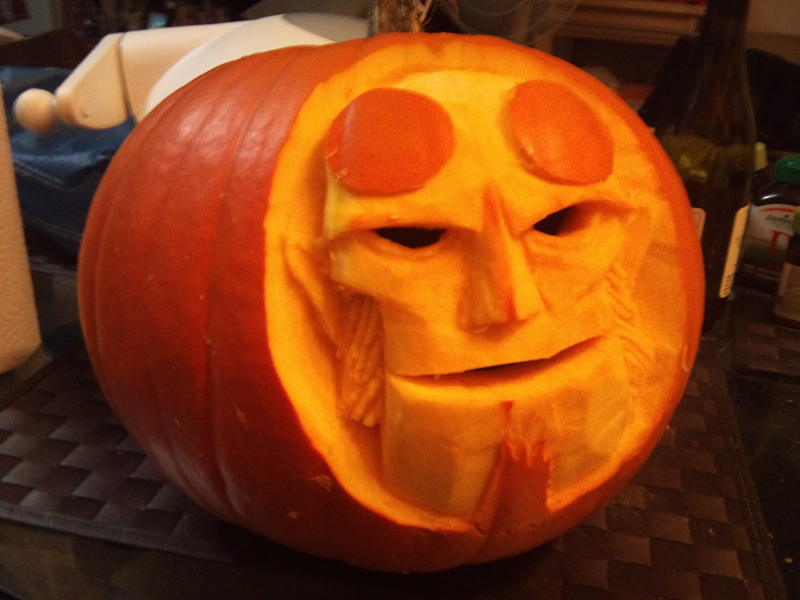 Dark Horse Comics wants to celebrate by giving you pumpkin-carving templates of Hellboy and The Goon and even their familiar Dark Horse colophon. You'll see what I mean right over here. I mentioned on an earlier occasion that I lavish comic books rather than candy upon the trick-or-treaters who are brave enough to cross the moat and approach the foreboding hayfamzone. I hope you give out comics also! Last year's launch of DC Comics' so-called New 52 hit Green Arrow hard. What we have now is an entirely new Oliver Queen, bearing no resemblance to the goatee-brandishing version that endured over 40 years since being introduced by Bob Haney and Neal Adams in 1969's The Brave and the Bold #85. That is the Oliver Queen that I know and this stranger traipsing around these days in the Green Arrow comic book every month has given me no compelling reason to become acquainted. There have been changes to Green Arrow on television sets also. G.A. had been a likeable supporting cast member on Smallville for its last couple of seasons, but that show ended a year or two ago. I certainly didn't foresee it but they gave Green Arrow his own series this year. If you haven't watched it yet, you should give it a try. It's not perfect, but it does have a style of its own and they're putting a sincere effort into it. At first I was surprised that it didn't feature the same actor from Smallville but this is yet another new spin on the character and the producers were correct to start fresh. Comics writer Marc Guggenheim was the hand behind the well done final run of Justice Society stories before that group was wiped out by the New 52, and he is a writer and executive producer on this new Arrow show. He included a fun little in-joke in the third episode when it was revealed that the flophouse where Deadshot was rooming was located at 1700 Broadway; 1700 Broadway is the real-life address of the offices of DC Comics! A twitter follower asked Marvel editor Tom Brevoort if Jack Kirby ever drew Wolverine. Unfortunately, the answer is no. Sorry about that, but maybe this animated gif of Wolverine will cheer you up. I've been a fan of Basil Wolverton's artwork since the first time I saw 1973's Plop! #1. His Spacehawk stories from decades earlier have been reprinted a number of times and Fantagraphics is the latest to take a swing at it; their new book is in full color and features nicely oversized pages. Over here at the Fantagraphics website you can view a 26-page preview AND you can watch a video of an interested reader thumbing through the edition. I already own the stories from an earlier reprinting effort but this new book looks so nice that I may just wind up getting it. Remember the Alamo! The above drawing was penciled and inked by Jack Kirby and lettered by Ben Oda. This double-page splash was published in 1951's Boys' Ranch #6 and the image shown was recently photographed from the original artwork. But wait, there's more to the story! If you are reading this before November 16, 2012, you have a chance to OWN this splendid artwork. The estate of Mr. Kirby's longtime partner Joe Simon is sending to auction a number of fabulous pages of Kirby artwork that have been in Mr. Simon's possession for decades. I invite you to visit Heritage Auctions at ha.com and type Jack Kirby into their search bar. You will be amazed at what you see next. I first heard of the impending auction of these many pages of great artwork over on Harry Mendryk's Simon and Kirby Blog. Harry is an old friend of The Hayfamzone Blog as you can read again over here, and I especially encourage you to read Harry's excellent treatise on the Remember the Alamo! spread right over here. Infinity Man intrigued me back in 1971 when Jack Kirby created him. He lived in some other dimension (which I believe was never shown in great detail) but, when the five Forever People raised the Mother Box over their heads and summoned him, Infinity Man took their place in this dimension. Mr. Kirby had so much story to tell about his Fourth World that he didn't get to show this fun swap as often as I might have preferred. I've mentioned before that collect original artwork of Jack Kirby characters as drawn by other creators. 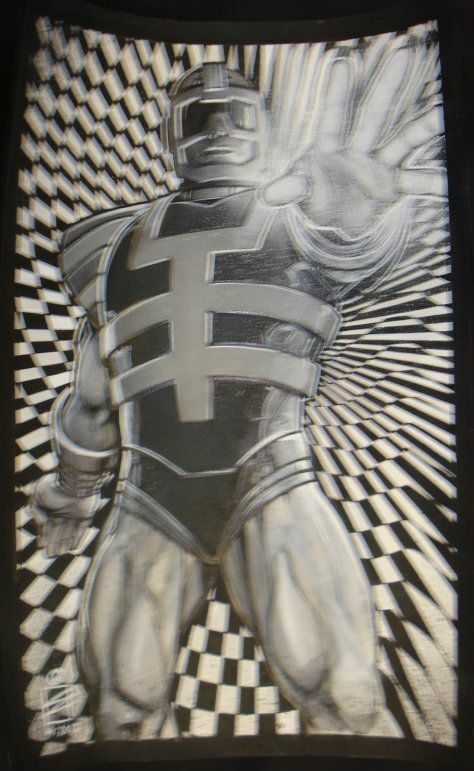 I liked very much when I saw the above mixed media drawing of Infinity Man show up on ebay last month, so I went ahead and won it. The artist is Eddy Newell, whose 1990s Black Lightning series I enjoyed a great deal. You can visit Eddy's website over here. I (wink wink) intentionally shot the above photo slightly out of focus for effect, but I will be posting a clearer image in my comicartfans Gallery Room. I invite you to check back right on this same page next week for that link. Hey look, it's Marv Wolfman! I very much enjoyed Crisis on Infinite Earths and this is how he looked when he wrote it back in 1985. He's looked the same since the early seventies, right? Then who's this down here? Also Marv Wolfman! I was surprised to find this photo on his Twitter page because I did not know he had cut off what I would call his signature beard. I would not have recognized the man if his name hadn't been printed right next to the picture. I decided to dig a little deeper. Todd Klein on his blog reported from this past summer's San Diego Comicon that Mr. Wolfman was sporting a beard again and showed a photo. (Todd's photo is copyrighted so I can't show it here, but you can see it for yourself over here.) The beard is white now but it is back. You can read a discussion board interchange about Mr. Wolfman and the color of his hair over here, or (much better) you can visit Mr. W's blog over here. 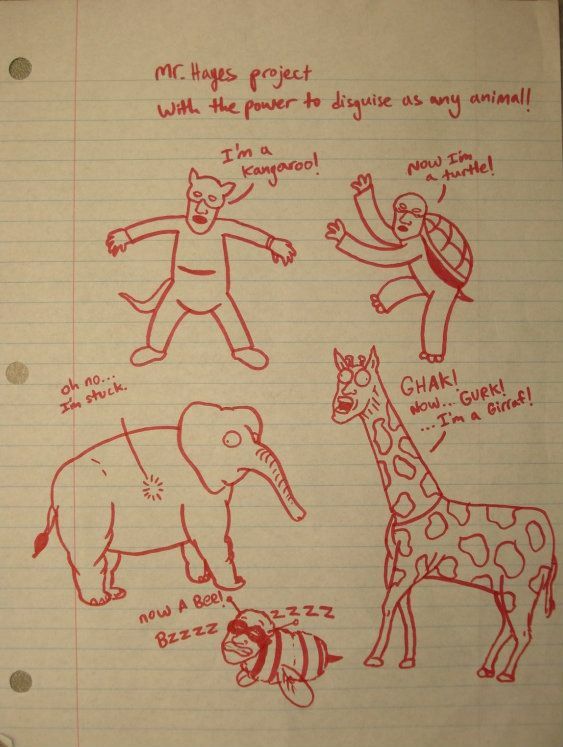 Jack Kirby made a mistake! He drew page 1 of 1971's New Gods #1 without allowing room for the indicia at the bottom of the page. Jack Adler and the Production Department at DC Comics had to make the artwork fit, and how they did it will almost certainly surprise you. I never knew about this before! 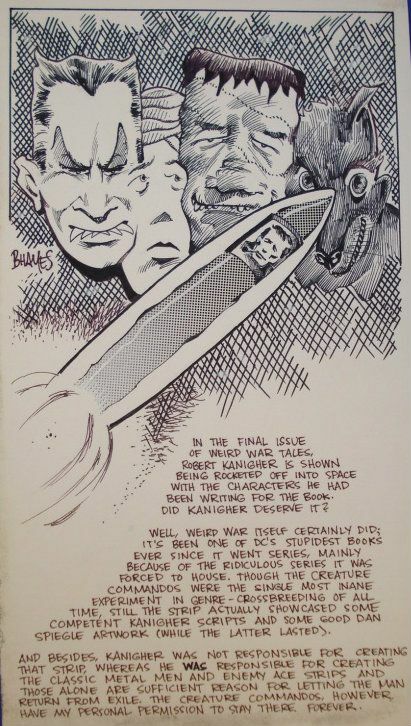 An article in the archives of the Jack Kirby Museum written by Rand Hoppe tells and shows the details, and you can read to your amazement over here. It's apparent from this article and from what I told you yesterday that Mr. Hoppe is a Scholar of Kirbydom and I hereby present him with an honorary Key to the Hayfamzone. Randolph Hoppe will give a presentation about the life and legacy of Jack Kirby on October 30, 2012 at the Hoboken Public Library in New Jersey. Mr. Hoppe is a trustee of the Jack Kirby Museum and Research Center, also located in Hoboken. You need to RSVP to attend this event and the details are over here. Three of my students decided this week that I should have superpowers, so they collaborated on the above sheet (viewable larger over here). Isn't it great? 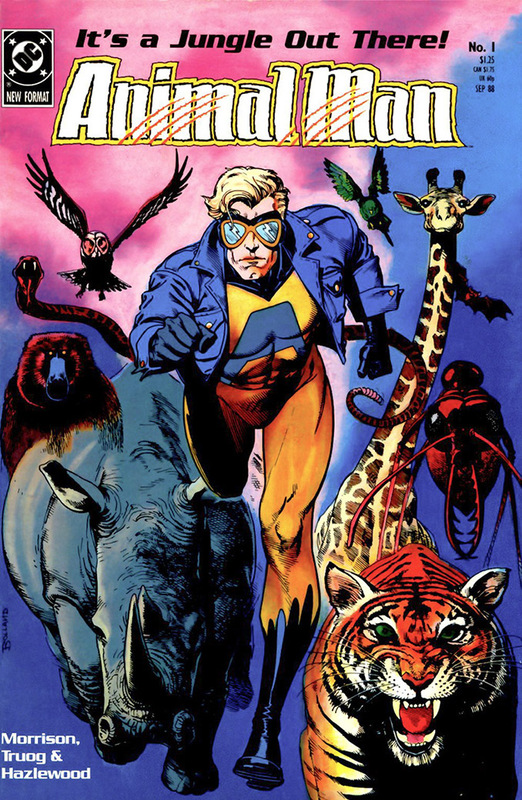 I told you before that I've always wanted to fly, but my students instead gave me some Animal Man abilities. Those are great powers and I accept them! 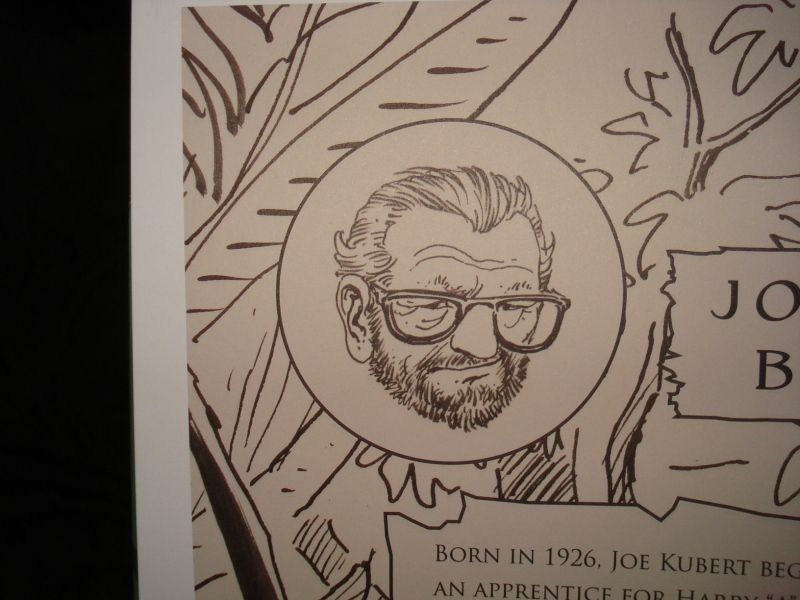 I'm not much of a Tarzan fan but I'm a huge fan of Joe Kubert. 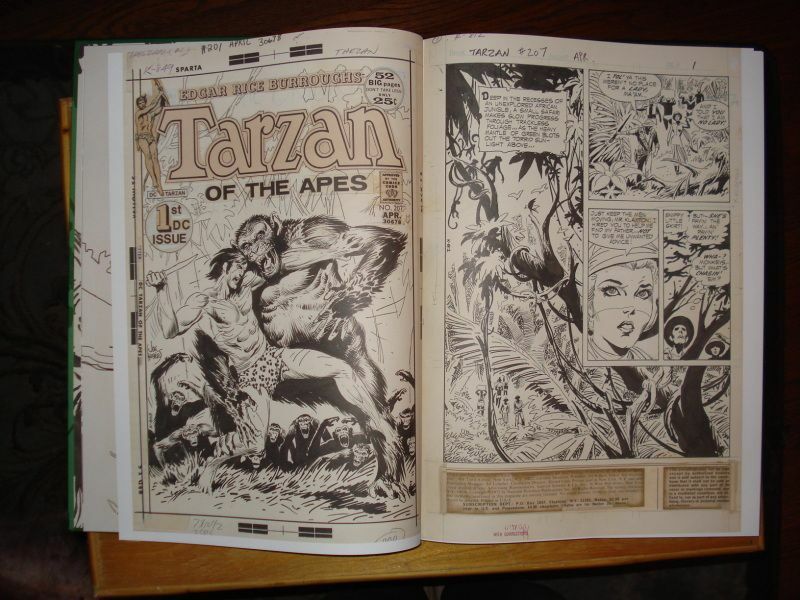 Last week I received the Artist's Edition of Joe Kubert's Tarzan and I'm very pleased with it. I like gigantic books to begin with, and this beauty is sized at a mammoth 12 inches by 17 inches. It presents Joe Kubert's first six DC Tarzan stories from 1972 in the same size as and shot directly from the original artwork. They shot the "black and white" artwork in color so that all of the editorial markings and blue pencil roughs appear clearly. Having this book is like owning over one hundred pages of Kubert originals but at less than the price that a single page of the original art would cost. Here is more information about this Artist's Edition and about publisher IDW. Above is an unused version of the cover to Jack Kirby's Mr. 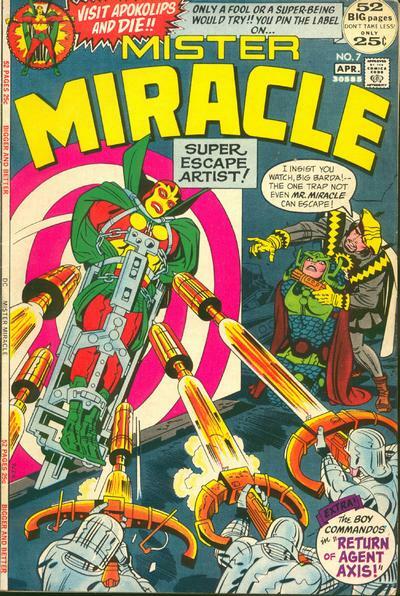 Miracle #7, and below is the published version as seen on a copy of the 1972 comic. Both are inked by Mike Royer and both are beautiful. Who Asked for More Comic Book Men? Yesterday was the first episode of the second season of Comic Book Men. Can I please just be buried in a shallow grave instead of watching any more of this? How about if I pluck out my eyeballs and roll them onto the expressway during rush hour? I told you back here and here that Comic Book Men was not exactly my favorite television show. Maybe it was you who clamored for a second season? No, it couldn't have been you. This show is just so tangential to what comic book collectors are interested in and, for that matter, to what goes on in a comic book store. I have never seen a store owner haggle with someone coming in off the street. Although Mike Grell and Keith Giffen each got a mention for a few seconds on the latest installment, the majority of the show was devoted to the preposterous prospect of convening a boy's birthday party in the store, and also people brought in Darth Vader masks and Mego dolls to sell. As I was walking down the stairs to watch the episode I could not remember from the springtime if it was a half-hour or full hour show. Isn't that funny? What a relief that it ended after thirty minutes! For the sake of the blog I'll keep watching this dog, but I doubt that I'll be giving weekly reports about it. I wouldn't do that to my worst enemy! This new film Argo is doing well in the theaters. Do you realize that Jack Kirby was involved in the real-life scenario that inspired that movie? More details are available over here. Mayor Michael Bloomberg declared it Spider-Man Day in New York City in honor of the character's fiftieth anniversary. Click on the Proclamation for a larger version. Back in May there was a comic book convention at the University of Chicago. It was entitled Comics, Philosophy and Practice. There was no dealers room where you could buy back issues of your favorite comics. Oh no. This wasn't that type of comic convention. This one was all talk. My kind of convention! The talk wasn't about DC Comics or Marvel Comics. It wasn't that type of convention either. No, all the participants had an underground or independent leaning. You'll get my meaning when I tell you that the guests included Robert Crumb, Lynda Barry, Chris Ware, Charles Burns, Daniel Clowes, Gary Panter, and Seth. The panel discussions were generally ninety (90!) minutes long and almost all of the proceedings were broadcast live over the internet. I was glued to my computer that entire weekend! (One of my live-tweets at the time was "I add Clowes, Seth, and Ware to my list of artists who look like they drew themselves. They join H. Chaykin and Marshall Rogers.") I enjoyed the panels very much, as I told you back here shortly after the convention ended. The organizers announced at that time that videos of the panels would be archived on the internet so a wider audience could appreciate them. It took a while, but the videos are now posted. There are three of them, each about ninety minutes in length, and it would not be a waste of your time to watch all three in their entirety, right over here. Enjoy! 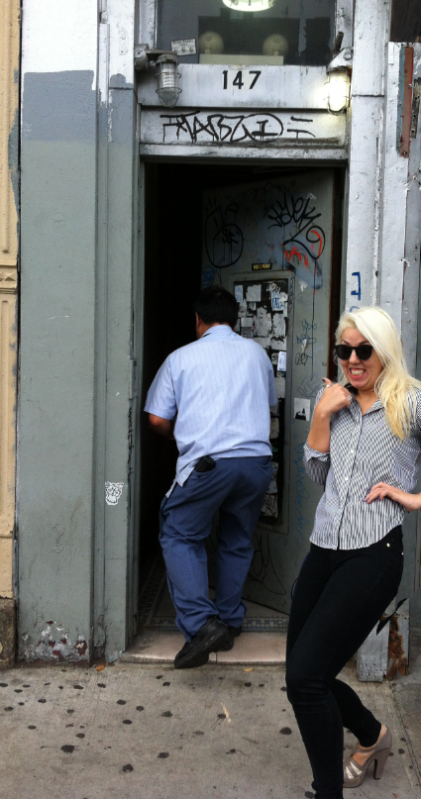 Hey look, it's Jeanette and The Mailman at the doorway of 147 Essex Street in New York City. 147 Essex Street does sound familiar, doesn't it? That's correct! It's Jack Kirby's birthplace! Recently I showed you a photo of Jaime and Gilbert Hernandez horsing around at that very same doorway, and it gave me an idea. You've probably heard of planking, in which people with nothing better to do take pictures of themselves stretched out as flat as a board in weird locations. Well that's just plain stupid. But I realized that it's about time that "Kirby" became a verb and here's how I will define this new word. "Kirbying" will hereafter be known as "the practice of taking your picture at Jack Kirby's birthplace." What great fun! This important building is on the Lower East Side of Manhattan. 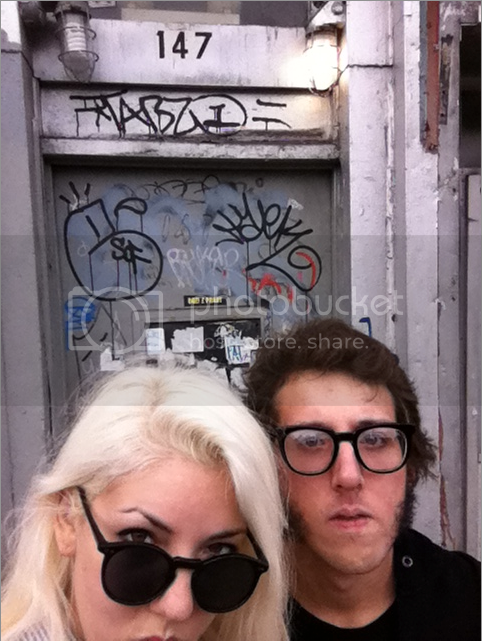 If you find yourself in Chinatown or Little Italy, you are just a short walk away from 147 Essex Street. I know just how to get this ball rolling. If you send me a photo of you Kirbying I will publish it right here on The Hayfamzone Blog. I Guarantee it! Hey look, now Jeanette and Tom are Kirbying! When I was much younger I thought Stan Lee was of Asian descent! This was before I ever saw any picture of the gentleman and I hadn't heard anything to the contrary. Yes, I was wrong, but I can't believe that I'm the only person who ever jumped to that incorrect conclusion about Mr. Lee! A week or two ago I saw a notice on the internet that Mr. Lee was cancelling his upcoming appearances. That didn't sound good at all! I direct-tweeted to Mr. Lee that I hoped everything was fine. I hope many of his other 384,095 followers did the same. Well it turns out that Mr. Lee has undergone a procedure to have a pacemaker placed next to his heart! I feel this news was not announced too widely and I'm happy to pass on that all is well. 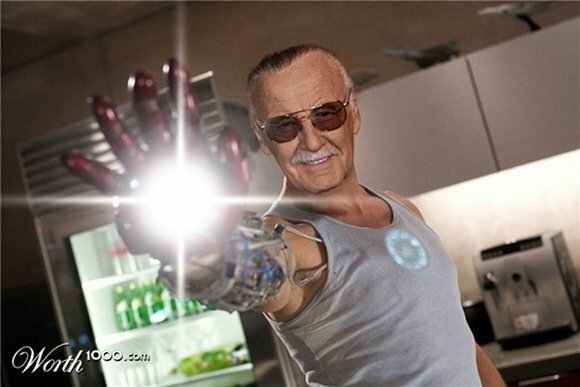 In this article Mr. Lee tells that he is proud to now be more like Iron Man! 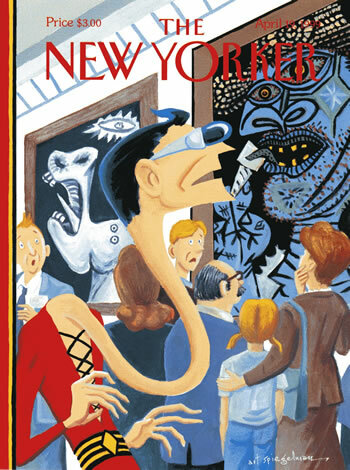 Art Spiegelman, who drew the Plastic Man New Yorker cover and who created Maus and who published Raw Magazine, has added credential to his resume. 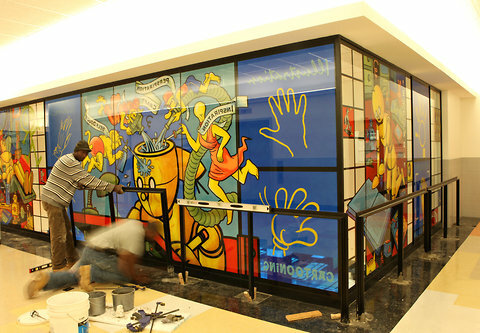 This week a mural he designed was installed in Manhattan's new High School of Art and Design building. Mr. S is a graduate of the school so this is pretty cool for him and for them. Kerry Callen takes the prize for starting the animated-comics-covers ball rolling. His latest handiwork is Fantastic Four #51 by Jack Kirby and Joe Sinnott. Nice, right? You can visit Kerry's blog over here. I always liked zipatone. You know, the transparent film with a printed pattern that an artist would x-acto-cut and affix to his drawing to achieve certain shading effects. 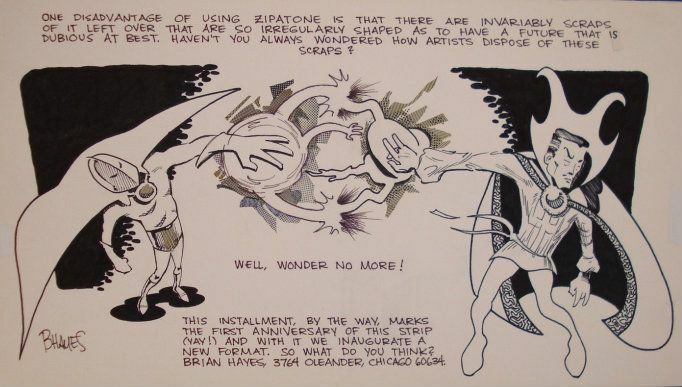 I liked zipatone as a comic reader, I liked it when I was drawing comics-related artwork of my own, and I'm not the only one who liked it; here is a nice article about zipatone that I found. At this point I haven't used any zipatone in decades, and they even stopped manufacturing it about twenty years ago. As a lark I bought a few pages of zipatone on ebay last month and (if the adhesive on those pages still has some stickiness to it) I'll make use of the zip in some upcoming artwork. When I say "comic book wallpaper" you probably assume I mean a background for your computer screen. But no. I'm here today to tell you that you can have comic book wallpaper on a wall in your home. The covers represented in the design span the decades but, as you will notice in an instant, every one of them is a Marvel/Atlas/Timely cover. That's too bad because I think the effort would be more interesting if it also spanned multiple publishers. I hope I have not deterred you from making a purchase! The merchant will be glad to accept your order over here. Anything drawn by Jack Kirby is great! Above is an unpublished and unfinished Charlie Chan cover from 1949. The word balloons were clearly lettered by Mr. Kirby, but the logo is a curiosity. The first five issues of the series featured Asian-tinged cover logo lettering (issue 5's cover is shown below), but were they thinking of changing it to block letters for the sixth issue? Or was JK just horsing around with extra time on his hands? (You do see Charlie Chan's face taking form inside the first C, don't you?) Or maybe this germ of a revised logo was actually the handiwork of the great Ben Oda who had lettered the covers of issues 1 through 5? The other day I wrote how I wished Brad Meltzer would come home and write some more comic books. Strange and unanticipated things do happen all the time, you know! Nobody ever expected that Neil Gaiman would be writing any new Sandman stories, yet exactly that has been announced for the near future. Here is a video of Mr. Gaiman giving an idea of what will happen in his story. Now let's focus all of our mental energies and maybe we can even impel James Robinson to write some more Starman! I never heard of the band Lung Leg before but they do have good taste. They chose Jaime Hernandez to draw the cover artwork for their 1999 Maid to Minx CD. I enjoy it when my two worlds collide and I can compose a little article that has to do both with comics and with school. Last week's Parade Magazine featured an essay written by comics writer and novelist Brad Meltzer, in which he thanked his high school English teacher. That's right, he thanked Ms. Spicer for fostering in him a love of reading and writing. I agree with him! Teachers are great! Hooray for teachers! You can read the Parade essay over here. Brad Meltzer is also great. I enjoyed his 2006 Justice League run (as I mentioned back here in one of the very first Hayfamzone Blog posts) far more than I am enjoying Geoff Johns' current run on the title. Sacrilege? Perhaps, but here in the hayfamzone we don't shy away from the truth. And wouldn't it be nice if some editor could woo Mr. Meltzer away from those novels of his and get him to write a few more comics? Ms. Spicer, will you please have a word with that young man?